The Führer is at present occupied with the question of the occupation of the Atlantic Islands with a view to the prosecution of war against America at a later date. Deliberations on this subject are being embarked on here'. After the fall of the Soviet Union, that is. The turn of the United States would come then. He put this clearly to Raeder when the Admiral saw him just two months later, on July 25, when the offensive in Russia was in full swing. "after the Eastern campaign," Raeder notes him as saying, "he reserves the right to take severe action against the U.S.A." But until then, Hitler emphasized to his Navy chief, he wanted to avoid having the U.S.A. declare war... out of consideration for the Army, which is involved in heavy combat." Raeder was not satisfied with this stand. In fact, his diary accounts of his meeting with Hitler, which one can now peruse in captured documents, show his growing impatience at the wraps which the Führer had placed on the German Navy. At every interview he sought to change the Leader's mind. Early that year, on February 4, Raeder submitted a memorandum to Hitler in which the Navy expressed strong doubts about the value of continued American neutrality, as it was working out, to Germany. In fact the admirals argued that America's entry into the war might even prove "advantages for the German war effort" if Japan thereby became a belligerent on the side of the Axis. But the Nazi dictator was not impressed by the argument. Raedeer was greatly discouraged. The Battle of the Atlantic was at its height and Germany was not winning it. American supplies under the Land-Lease agreement were pouring into Britain. The Pan-American Neutrality Patrol was making it more and more difficult for U-boats to be effective. All this Raeder pointed out to Hitler, but without much effect. He saw the Leader again on March 18 and reported that the U.S. warships were escorting American convoys bound for Britain as far as Iceland. He demanded authority to attack them without warning. He asked that something be done to prevent the U.S.A. from gaining a foothold in French West Africa. The possibility, he said, "was most dangerous." Hitler listened and said he would discuss these matters with the Foreign Office (of all places! ), which was one way of putting the admirals off. All through the spring and early summer he continued to put them off. On April 20 he refused to listen to Raeder's pleas "for warfare against merchant ships of the U.S.A., according to prize regulations." [Unrestricted submarine warfare is a type of naval warfare in which submarines sink vessels such as freighters and tankers without warning, as opposed to attacks per prize rules (also known as "cruiser rules"). 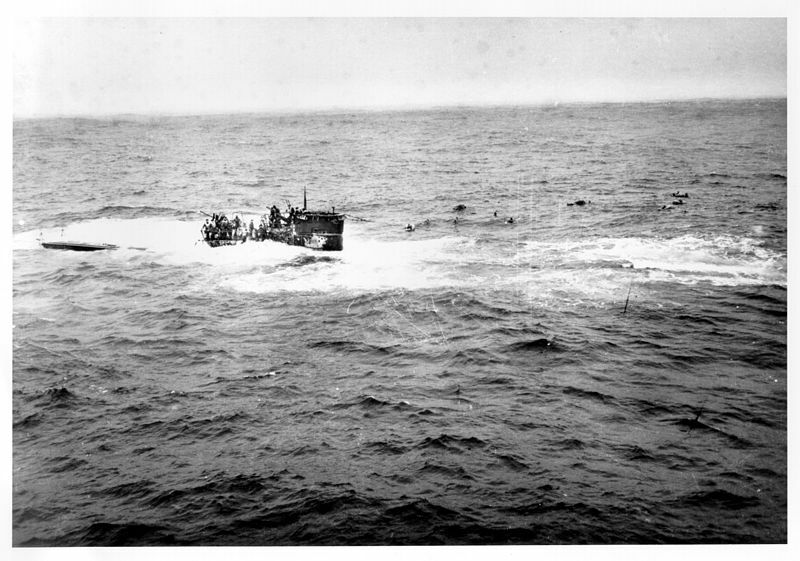 Prize rules call for submarines to surface and search for merchantmen and place crews in "a place of safety" (for which lifeboats did not qualify, except under particular circumstances) before sinking them, unless the ship has shown "persistent refusal to stop ... or active resistance to visit or search, sic]"The first recorded clash between American and German war vessels had occurred o April 10 when the U.S. destroyer 'Niblack" dropped depth charges on a German U-boat which showed signs of attacking. On May 22 Raeder was back at the Berghof with a long memorandum suggesting countermeasures to President Roosevelt's friendly acts, but could not move his Supreme commander. There was all the more reason to avoid such incidents when the campaign in Russia began, and on 21 June, the day before the attack commenced, Hitler emphasized this to Raeder. The Grand Admiral had given him a glowing report of how U-253, spotting the U.S. battleship 'Texas' an accompanying destroyer within the blockade zone in the North Atlantic proclaimed by Germany, had chased and attempted to attack them" and added that "where the U.S.A. is concerned firm measures are always more effective than apparent yielding." The Führer agreed with the principle but not with the specific action and once more he admonished the Navy. The Führer declares in detail that until Operation Barbarossa is well under way he wishes to avoid any incident with the U.S.A. After a few weeks the situation will become clearer, and can be expected to have a favourable effect on the U.S.A. and Japan. America will have less inclination to enter the war due to the threat from Japan which will then increase. 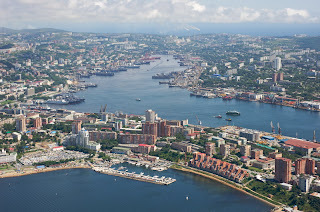 If possible, therefore, in the next weeks all attacks on naval vessels in the closed area should cease. 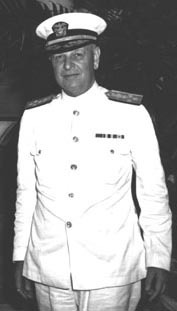 When Raeder attempted to argue that at night it was difficult to distinguish enemy from neutral warships Hitler cut him short by instructing him to issue new orders to avoid incidents with America. As a result the Navy Chief sent out orders the same night calling off attacks on any naval vessels "inside or outside the closed area" unless they were definitely identified as British. A similar order was given the Luftwaffe. On July 9, President Roosevelt announced that American forces were taking over the occupation of Iceland from the British. The reaction in Berlin was immediate and violent. Ribbentrop cabled Tokyo that "this intrusion of American military forces in support of England into a territory which has been officially proclaimed by us to be a combat area is in itself an aggression against Germany and Europe." 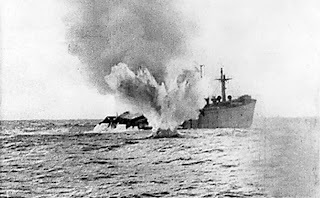 When Raeder argued that his naval commanders could not be held responsible for a "mistake" if American ships were hit, Hitler retorted that at least in regard to a war vessels the Navy had better "definitely established" that they were enemy craft before attacking. 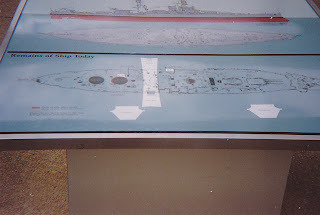 To make sure that the admirals understood him correctly the Führer issued a specific order on July 19 stipulating that "in the extended zone of operations U.S. merchant ships, whether single or sailing in English or American convoys and if recognized as such before resort to arms, are not to be attacked. Within the blockaded area, which was also recognized by the United States as being out of bounds, American vessels could be attacked, but Hitler specifically laid down in this order that this war zone "did not include the U.S.A. - Iceland sea route." But "mistakes", as Raeder said, were bound to occur. On May 21 a U-boat sank he American freighter 'Robin Moor en route to South Africa at a place well outside the German blockade zone. Two more American merchant vessels were torpedoed toward the end of the summer. On September 4, a German submarine fired two torpedoes at he U.S, destroyer 'Greer', both missing. A week later, on September 11, Roosevelt reacted to this attack in a speech in which he announced that he had given orders to the Navy to "shoot at sight" and warned that he Axis warships entering American defence zone did so "at heir peril." The speech incensed Berlin. In the German press Roosevelt was attacked as "Warmonger number One.' Ribbentrop recalled at Nürnberg that Hitler 'was greatly excited'. However, by the time Admiral Raeder arrived at the Wolfsschanze headquarters on the Eastern front on the afternoon September 17 to urge a drastic retaliation to the " shoot on sight" order, the Führer had calmed down. To the Admiral's plea that the German Navy at last be released from the restriction against attacking American ships the Supreme Commander again gave a firm No. "Therefore," Raeder noted sadly, "the Commander in Chief, Navy, and the Commanding Admiral Dönitz, withdraw their suggestions. The submarines are to be informed of the reason for temporarily keeping to the old orders. In view of the circumstances, Hitler was certainly behaving with unaccustomed restraint . But admittedly it was certainly more difficult for the young U-boat commanders, operating in the stormy waters of the North Atlantic and constantly harassed by increasingly effective British antisubmarine measures in which the U.S.A. war vessels sometimes joined, to restrain themselves. Hitler had told Raeder in July that he would never call a submarine skipper to account if he sank an An=American ship "by mistake". On November 9, in his annual address to the Nazi Old Guard at the familiar beer cellar in Munich, he answered Roosevelt's speech. "President Roosevelt has ordered his ships to shoot the moment they sight German ships. I have ordered German ships not to shoot when they sight American vessels, but to defend them selves when attacked. I will have any German officer court-marshalled who fails to defend himself. German submarine U-48 was a Type VIIB U-boat of the German Kriegsmarine during World War II, and the most successful that was commissioned. During her two years of active service, U-48 sank 55 ships for a total of 321,000 tons; she also damaged two more for a total of 12,000 tons over twelve war patrols conducted during the opening stages of the Battle of the Atlantic. U-48 was built at the Germaniawerft in Kiel as 'werk' 583 during 1938 and 1939, being completed a few months before the outbreak of war in September 1939 and given to Kapitänleutnant Herbert Schultze. When war was declared, she was already in position in the North Atlantic, and received the news via radio, allowing her to operate immediately against Allied shipping.She was a member of two wolf packs. U-48 survived most of the war and was scuttled by her own crew on 3 May 1945 off Neustadt in order to keep the submarine out of the hands of the advancing allies. 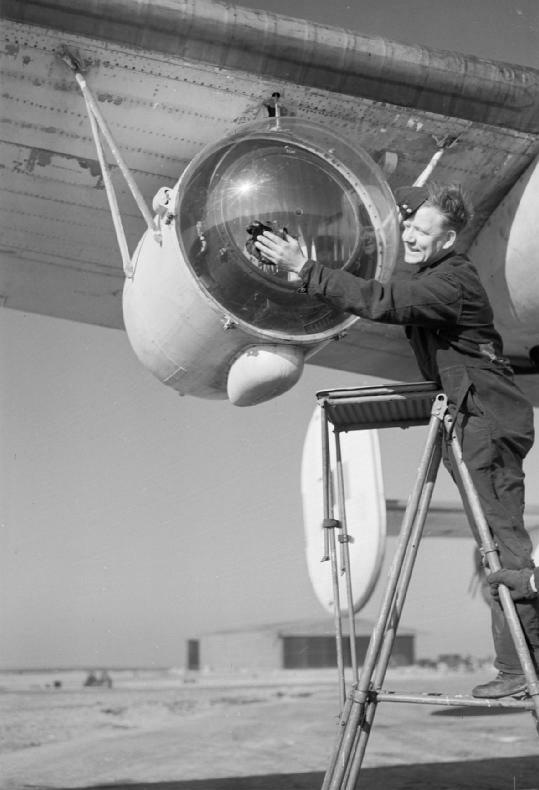 Leigh Light fitted to a Royal Air Force Coastal Command Liberator, 26 February 1944. Detection by radar-equipped aircraft could suppress U-boat activity over a wide area, but an aircraft attack would only be successful with good visibility. U-boats were quite safe from aircraft at night, since the deployment of an illuminating flare gave adequate warning of an attack. The introduction by the British of the Leigh Light in June 1942 was a significant factor in the North Atlantic struggle. It was a powerful searchlight that was automatically aligned with the airborne radar to illuminate targets suddenly while in the final stages of an attack run. This let British aircraft attack U-boats recharging batteries on the surface at night, forcing German submarine skippers to switch to daytime recharges. 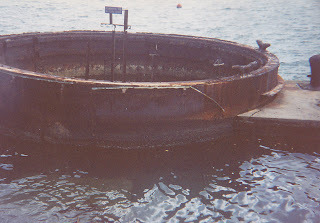 The U-boat commanders who survived reported a particular fear of this weapon system since aircraft could not be seen at night, and the noise of an approaching aircraft was inaudible above the din made by the boat. 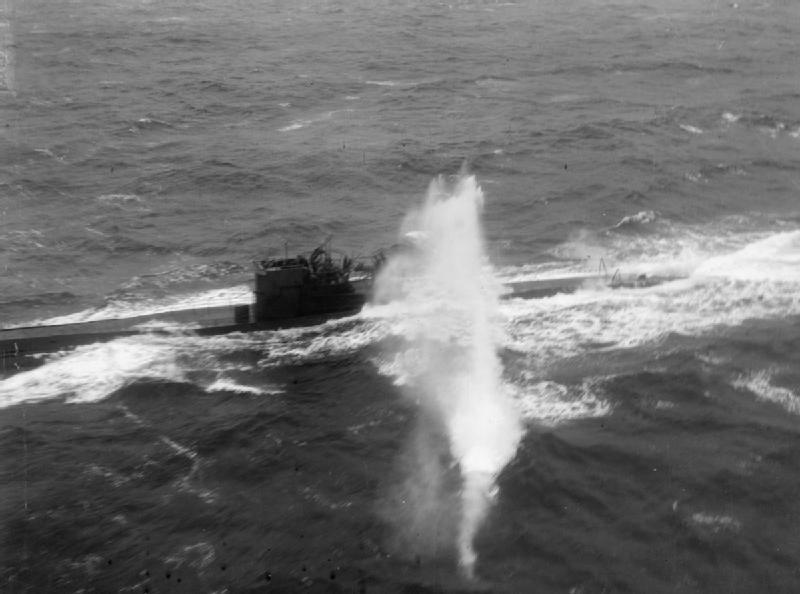 The aircraft made contact with the submarine using centimetric radar, which was undetectable with typical U-boat equipment, then lined up on an attack run. (When metric radar was used, the set would automatically lower the radar power during the approach so the submarine would not detect it.) With a mile or so to go the searchlight would automatically switch on, immediately and accurately illuminating the target from the sky, giving about five seconds warning before it was hit with a stick of depth bombs. A drop in Allied shipping losses from 600,000 to 200,000 tons per month was attributed to this ingenious device. Major ceremonies were held in 1982 to mark the one hundredth anniversary of the birth of Franklin Delano Roosevelt. With the exceptions of Washington and Lincoln, he was glorified and eulogized as no other president in American history. Even conservative President Ronald Reagan joined the chorus of applause. In early 1983, newspapers and television networks remembered the fiftieth anniversary of Roosevelt's inauguration with numerous laudatory tributes.And yet, with each passing year more and more new evidence comes to light which contradicts the glowing image of Roosevelt portrayed by the mass media and politicians.Much has already been written about Roosevelt's campaign of deception and outright lies in getting the United States to intervene in the Second World War prior to the Japanese attack on Pearl Harbor in December 1941. Roosevelt's aid to Britain and the Soviet Union in violation of American neutrality and international law, his acts of war against Germany in the Atlantic in an effort to provoke a German declaration of war against the United States, his authorization of a vast "dirty tricks" campaign against U.S. citizens by British intelligence agents in violation of the Constitution, and his provocations and ultimatums against Japan which brought on the attack against Pearl Harbor -- all this is extensively documented and reasonably well known. Not so well known is the story of Roosevelt's enormous responsibility for the outbreak of the Second World War itself. Focusings on Roosevelt's secret campaign to provoke war in Europe prior to the outbreak of hostilities in September 1939. I deal particularly with his efforts to pressure Britain, France and Poland into war against Germany in 1938 and 1939. Franklin Roosevelt not only criminally involved America in a war which had already engulfed Europe. He bears a grave responsibility before history for the outbreak of the most destructive war of all time. 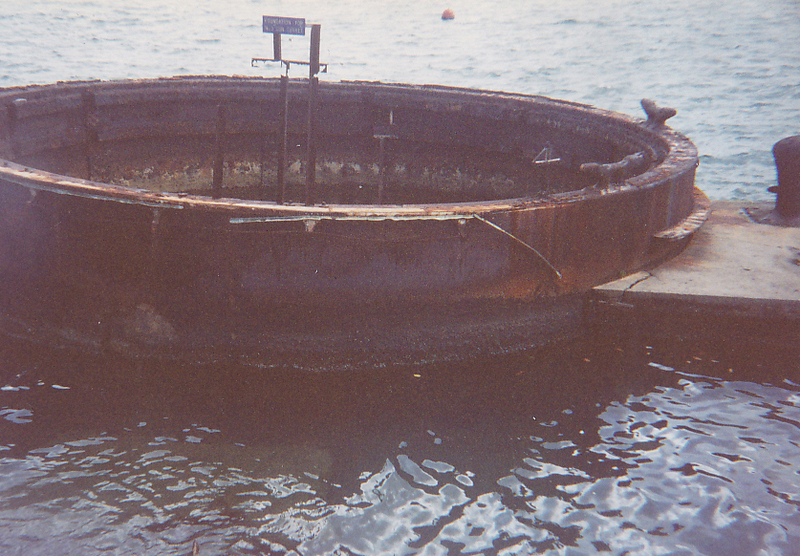 The submarine base in Lorient"
President Franklin Roosevelt called December 7, 1941, "a date which will live in infamy." 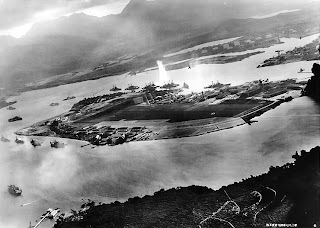 On that day, Japanese planes attacked the United States Naval Base at Pearl Harbour, Hawaii Territory. The bombing killed more than 2,300 Americans. 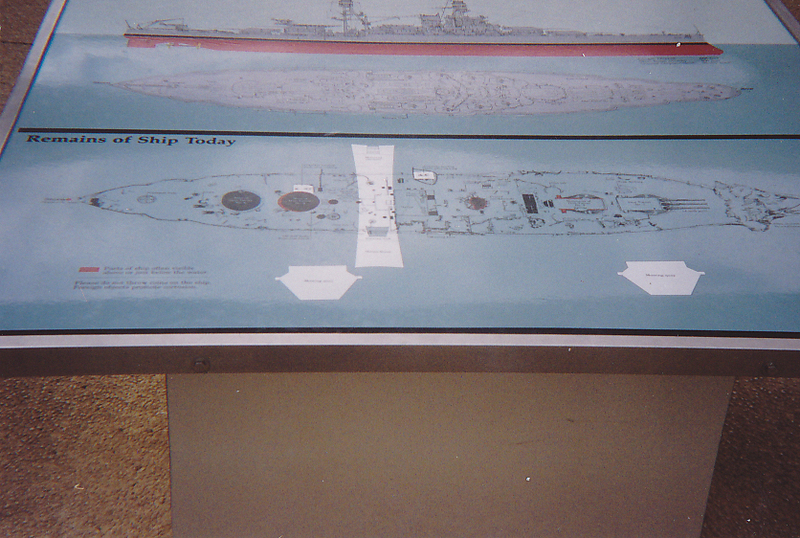 It completely destroyed the American battleship U.S.S. Arizona and capsized the U.S.S. Oklahoma. The attack sank or beached a total of twelve ships and damaged nine others. 160 aircraft were destroyed and 150 others damaged. 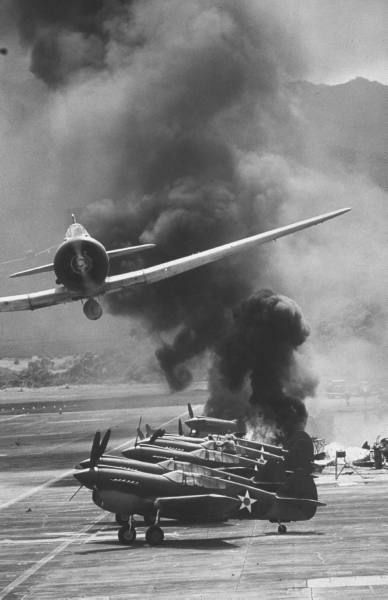 The attack took the country by surprise, especially the ill-prepared Pearl Harbour base. The ranking United States naval officer in Pearl Harbour, known as the Commander-in-Chief Pacific, sent this hurried dispatch to all major navy commands and fleet units. Radio stations receiving the news interrupted regular broadcasts to announce the tragic news to the American public. Most people knew what the attack meant for the U.S. even before Roosevelt's official announcement the next day. The U.S. would declare war on Japan. The U.S. was already close to joining the war, but in an attempt to preserve its stance of isolation and neutrality, it had only committed to sending war supplies on loan to the Allied forces, mainly Great Britain, France, and Russia. Within days, Japan's allies, Germany and Italy (known collectively as the Axis powers), declared war on the United States. December 7, the "date which will live in infamy," brought the United States into World War II. 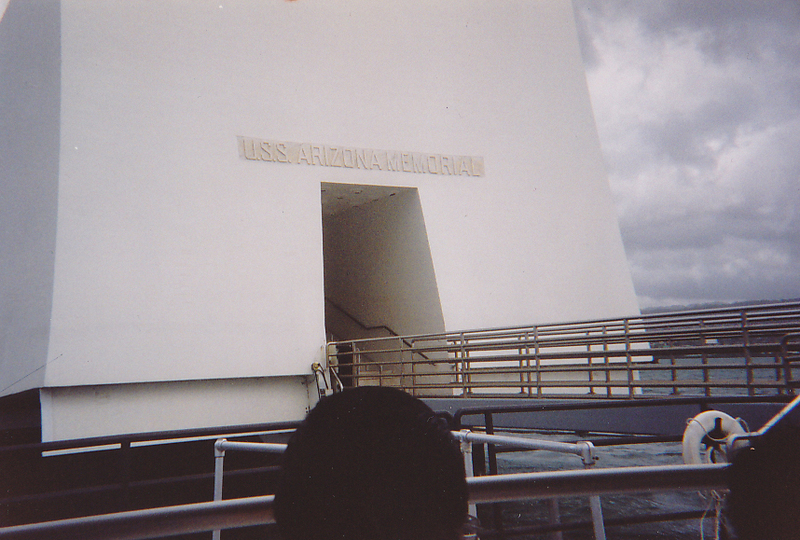 I took this picture during my visit May 1993 to Pearl Harbour. 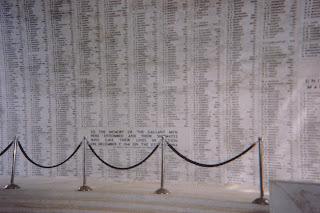 The inscription in marble with the names of Arizona's honoured dead reads:""To the Memory of the Gallant Men Here Entombed and their shipmates who gave their lives in action on 7 December 1941, on the U.S.S. Arizona"
Japan, had been assigned by Hitler the role not of bringing the United States into the war but keeping her, at least for the time being, out of it. He knew that if the Japanese took Singapore and threatened India this would not only be a severe blow to the British but would divert America's attention, and some of her energies, from the Atlantic to the Pacific. 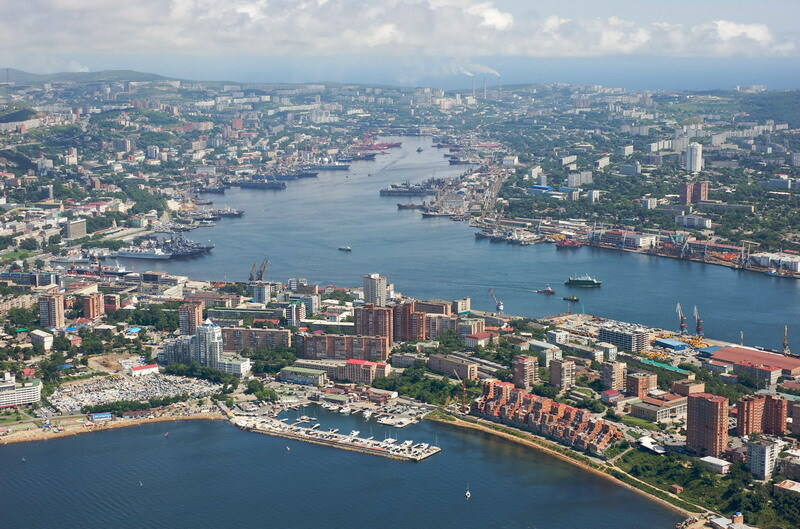 Even after he began begging the Japanese to attack Vladivostok he saw in this the means not only to help him bring Russia down but further pressure the United States into remaining neutral. Strangely enough, it never seems to occurred to him or to anyone else in Germany until very late that Japan had her own fish to fry and that the Japanese might be fearful of embarking on a grand offensive in South-east Asia against the British and Dutch, not to mention attacking Russia in the rear, until they had secured their own rear by destroying the United States Pacific Fleet. 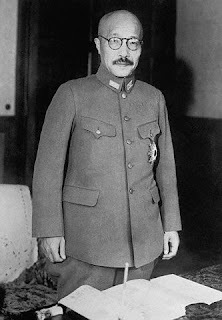 True, the German conqueror had promised Matsuoka that Germany would go to war with America if Japan did, but Matsuoka was no longer in the government, and, besides, Hitler had constantly nagged the Japanese to avoid a direct conflict with America and concentrate on Britain and the Soviet Union, whose resistance was preventing him from winning the war. It did not dawn on the Nazi rulers that Japan might give first priority to a direct challenge to the United States. One member of such group was Admiral Kishisaburo Nomura, who arrived in Washington in February 1941 as the new Japanese ambassador and whose serious of confidential conversation with Cordell Hull which began in March, with the aim of settling peacefully the differences between the two countries, and which continued right up to the end, gave considerable worry in Berlin. In fact, the Germans did their best to sabotage the Washington talks. As early as May 15, 1941, Weizäcker submitted a memorandum to Ribbentrop pointing out that "any political treaty between Japan and the United States is undesirable at the present" and arguing that unless it were prevented Japan might be lost to the Axis. Secretary Hull learned immediately of this German pressure, thanks to "Magic", as it was called, which since the end of 1940 had enabled the American government to decode intercepted Japanese cable and wireless messages in Tokyo's most secret ciphers, not only those sent to and from Washington but those to and from Berlin and other capitals. The German demand was cabled by Tokyo to Nomura on October 16, 1941, along with instructions to present a watered-down version to Hull. The Konoye government fell and was replaced by a military cabinet headed by the hotheaded, belligerent General Hideki Tōjō . The sand were now rapidly running out. 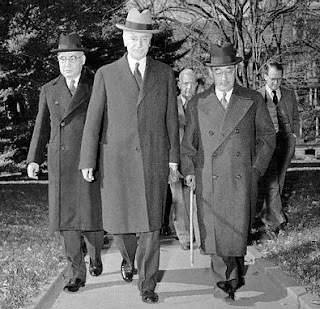 On November 15, Saburo Kurusu arrived in Washington as a special ambassador to aid Nomura in the negotiations, but Secretary Hull soon sensed that the diplomat, who as the Japanese envoy in Berlin was somewhat pro-German, had brought no fresh proposals with him. His purpose, Hull thought, was to try to persuade Washington to accept the Japanese terms at once, or, if that failed, to lull the American government with talk until Japan was ready to strike a heavy surprise blow. On November 19 came the ominous "Winds" message to Nomura from Tokyo, which Hull's cryptographers promptly deciphered. If the Japanese newscaster on short wave Tokyo broadcast, which the Embassy picked up daily, inserted the words"East wind, rain," that would mean that the Japanese government had decided on war with America. Nomura was instructed, on receipt of the "Winds" warning, to destroy all codes and confidential papers. 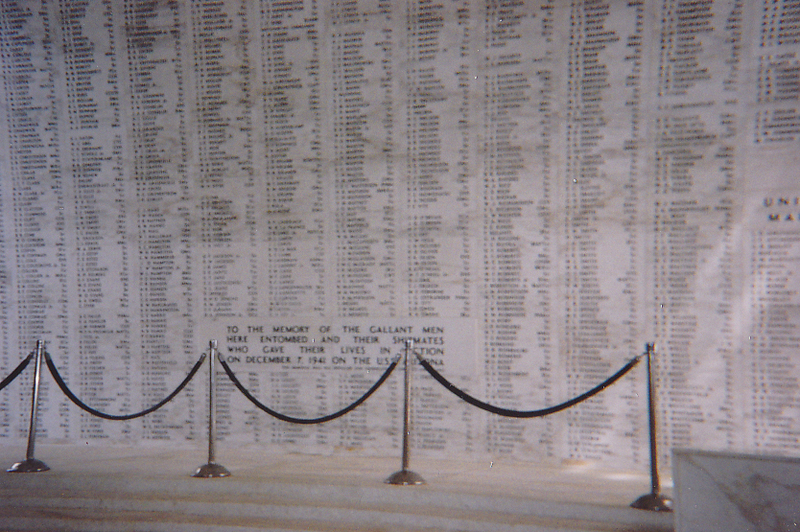 NOVEMBER 25, 1941, THE CRUCIAL DATE. On that day the Japanese carrier task force sailed for Pearl Harbour. In Washington Hull went to the White House to warn the War Council of the danger confronting the country from Japan and to stress to the U.S. Army and Navy Chiefs the possibility of Japanese surprise attacks. In Berlin that day there was a somewhat grotesque ceremony in which the three Axis Powers, amid much pomp and ceremony, renewed the Anti-Comintern Pact of 1936, an empty gesture which, as some German noted, did absolutely nothing to get Japan into the war against Russia but which afforded the pompous Ribbentrop an opportunity to denounce Roosevelt as the "chief culprit of this war" and to shed crocodile tears for the truthful religious... American people" betrayed by such an irresponsible leader. The German Foreign Minister seems to become intoxicated by his own words. He called Oshima on he evening of November 28, following a lengthy council of war earlier that day presided over by Hitler, and gave the Japanese ambassador the impression that the German attitude toward the United States, as Oshima promptly radioed Tokyo, had considerably stiffened." Hitler's policy of doing everything possible to keep America out of the war until Germany was ready to take her on seemed about jettisoned. Suddenly Ribbentrop was urging the Japanese to go to war against the United States as well as Britain and promising the backing of the Third Reich. After warning Oshima that "if Japan hesitates... all the military might of Britain and the United States will be concentrated against Japan", a rather silly thesis as long as the European war continued. The ambassador, a tense little man, was agreeably surprised. But he wanted to be sure he understood correctly. "Is your Excellency," he asked, "indicating that a state of actual war is to be established between Germany and the United States?" Ribbentrop hesitated. Perhaps he had gone too far. "Roosevelt is a fanatic," he replied, "so it is impossible to tell what he is going to do." This seemed a strange and unsatisfactory answer to Oshima in view of what the Foreign Minister had said just before, and toward the end of the talk he insisted on coming back to the main point. What would Germany do if the war were actually extended to "countries which have been aiding Britain?" Should Japan become engaged in a war against the United States, Ribbentrop replied, Germany, of course, would join the war immediately. There is absolutely no possibility of Germany's entering into a separate peace with the United States under such circumstances. The Führer is determined on that point. This was the flat guarantee for which the Japanese government had been waiting. True, Hitler had given a similar one in the spring to Matsuoka, but it seem to have forgotten during the intervening period when he had become vexed at Japan's refusal to join in the war on Russia. All that remained now, so far as the Japanese were concerned, was to get the Germans to put their assurance in writing. General Oshima joyfully filed his report to Tokyo on November 29. Fresh instructions reached him in Berlin the next day. The Washington talks, he was informed, "now stand ruptured-broken." The Japanese carrier fleet was now on its way to Pearl Harbour. Tokyo was in a hurry to get Germany to sign. On the same day that Oshima was receiving his new instructions, November 30, the Japanese Foreign Minister was conferring with the German ambassador in Tokyo, to whom he emphasized that the Washington talks had broken down because Japan refused to accede to American demands that she abandon the Tripartite Pact. The Japanese hoped the Germans would appreciate this sacrifice in a conman cause. "Grave decisions are at stake," Togo told General Ott. "the United States is seriously preparing for war...Japan is not afraid of a breakdown in negotiations and hopes that in case Germany and Italy, according to the Tripartite Agreement, will stand by her side." The Japanese had a draft treaty, approved by both Hitler and Mussolini, but they did not yet have it signed, and this worried them. They suspected that the Führer was stalling because he wanted a 'quid pro quo' if Germany joined the Japanese in the war against Russia. In his telegram of instructions to Oshima on November 30, the Japanese Foreign Minister had given some advice on how to handle this ticklish problem if the Germans and Italians raised it. December 6 came. Zhukov that very day launched his counter-offensive in front of Moscow and the German Armies reeled back in the snow and bitter cold. There was more reason for Hitler to demand his 'quid pro quo'. On this question there was great uneasiness in the Foreign Office in Tokyo. The Naval Task Force was now within flying distance of Pearl Harbour for its carrier planes. So far, miraculously, it had not been discovered by American ships or aircraft. But it might be any moment. A long message was being radioed from Tokyo to Momura and Kurusu in Washington instructing them to call on Secretary Hull at precisely 1 P.M. the next day, Sunday, December7, to present Japan's rejection of the latest American proposals, and stressing that the negotiations were "de facto ruptured." On December 9, 1941, the Japanese launched a surprise attack on Pearl Harbour and hastened the entry of the United States into World War II on the side of the Allies. President Franklin D. Roosevelt signing the Declaration of War against Japan on the day following the attack. Hitler's Reichstag's Speech, in response to Roosevelt's declaration of war...'I have therefore arranged for the passports to be handed to the American chargé de affairs today and the following'--At this point the deputies of the Reichstag leaped to their feet cheering and the Führer's words were drowned in the bedlam, [I still remember the speech which we had to listen to as youngsters, when he said:'Herr Roosevelt sent me a letter, demanding that I respect the integrity and interdependence of the following states', then came the real punch line for effectiveness, 'I quote them to you by their sizes: Andorra, Monaco, Lichtenstein, The Vatican...that was when the Gauleiters (Deputies) roared with laughter and bedlam broke out,sic] . Shortly afterwards, at 2:30 P.M., Ribbentrop, in one of his most frigid poses, received Leland Morris, the American chargé de affairs in Berlin, and while keeping him standing read out Germany's declaration of war, handed him a copy and icily dismissed him. The day after the attack, President Franklin D. Roosevelt addressed a joint session of United States Congress. Roosevelt called December 9 "a date which will live in infamy". Congress declared war on the Empire of Japan amid outrage at the attack and the late delivery of the note from the Japanese government breaking off relations with the U.S. government, actions considered treacherous. Pacifist Representative Jeannette Rankin, a Republican from Montana, cast the only dissenting vote. 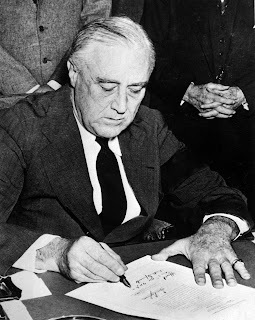 Roosevelt signed the declaration of war later the same day. Continuing to intensify its military mobilization, the U.S. government finished converting to a war economy, a process begun by provision of weapons and supplies to the Soviet Union and Great Britain. The Pearl Harbour attack immediately galvanized a divided nation into action. Public opinion had been moving towards support for entering the war during 1941, but considerable opposition remained until the attack. Overnight, Americans united against Japan in response to calls to "Remember Pearl Harbour." American solidarity in the war effort probably made possible the unconditional surrender position later taken by the Allied Powers. Some historians, among them Samuel Eliot Morison, believe the attack doomed Japan to defeat simply because it awakened the "sleeping giant", regardless of whether the fuel depots or machine shops had been destroyed or even if the carriers had been caught in port and sunk. U.S. industrial and military capacity, once mobilized, was able to pour overwhelming resources into both the Pacific and Atlantic theatres. Others, such as Clay Blair, Jr., and Mark Parillo believe Japanese trade protection was so incompetent that American submarines alone might have strangled Japan into defeat. Perceptions of treachery in the attack before a declaration of war sparked fears of sabotage or espionage by Japanese sympathizers residing in the U.S., including citizens of Japanese descent and was a factor in the subsequent Japanese internment in the western United States. Other factors included misrepresentations of intelligence information (none) suggesting sabotage, notably by General John DeWitt, commanding general of Western Defence Command on the Pacific Coast, who had personal feelings against Japanese Americans. In February 1942, Roosevelt signed United States Executive Order 9066, requiring all Japanese Americans to submit themselves for an internment. 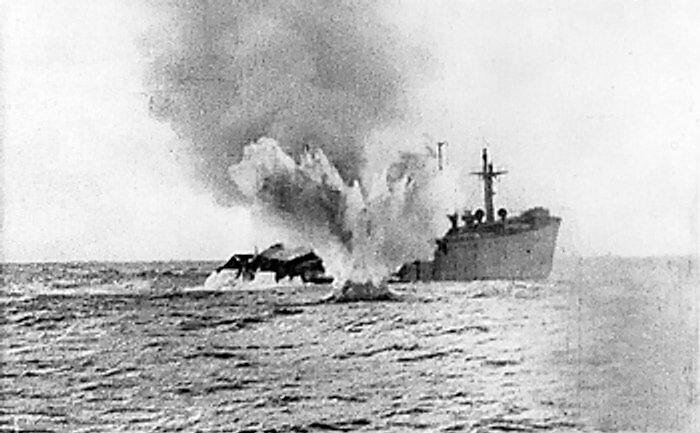 Propaganda made repeated use of the attack, because its effect was enormous and impossible to counter. "Remember Pearl Harbour!" became the watchwords of the war. The American government understated the damage inflicted, in hopes of preventing the Japanese from learning it, but the Japanese had, through surveillance, a good estimate. To boost morale following the defeat at Guadalcanal, Yamamoto decided to make an inspection tour throughout the South Pacific. 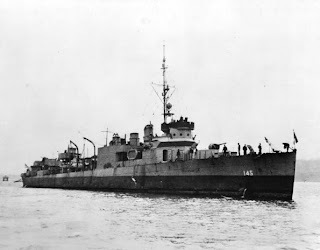 On 14 April 1943, the US naval intelligence effort, code-named "Magic", intercepted and decrypted a message containing specific details regarding Yamamoto's tour, including arrival and departure times and locations, as well as the number and types of planes that would transport and accompany him on the journey. Yamamoto, the itinerary revealed, would be flying from Rabaul to Balalae Airfield, on an island near Bougainville in the Solomon Islands, on the morning of 18 April 1943. U.S. President Franklin D. Roosevelt ordered Secretary of the Navy Frank Knox to "Get Yamamoto." Knox instructed Admiral Chester W. Nimitz of Roosevelt's wishes. 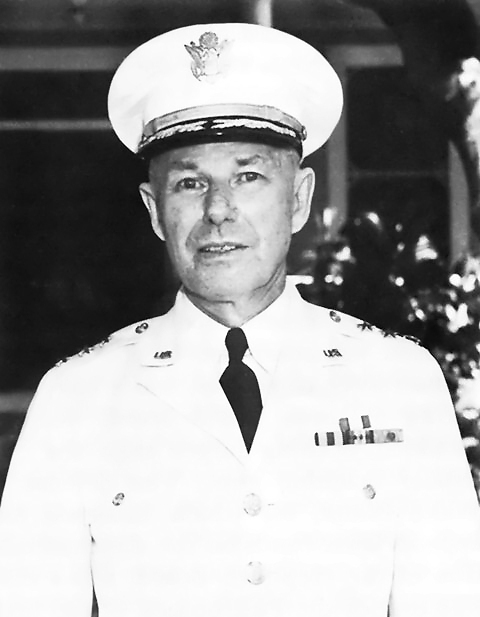 Admiral Nimitz consulted Admiral William F. Halsey, Jr., Commander, South Pacific, then authorized a mission on 17 April to intercept Yamamoto's flight en route and shoot it down. A squadron of Lockheed P-38 Lightning aircraft were assigned the task as only they possessed the range to intercept and engage. Select pilots from three units were informed that they were intercepting an "important high officer" with no specific name given. On the morning of 18 April, despite urgings by local commanders to cancel the trip for fear of ambush, Yamamoto's two Mitsubishi G4M fast transport aircraft left Rabaul as scheduled for the 315 mi (507 km) trip. Sixteen Lightnings intercepted the flight over Bougainville and a dogfight ensued between them and the six escorting Mitsubishi A6M Zeroes. First Lieutenant Rex T. Barber engaged the first of the two Japanese transports which turned out to be Yamamoto's plane. He targeted the aircraft with gunfire until it began to spew smoke from its left engine. Barber turned away to attack the other transport as Yamamoto's plane crashed into the jungle. The crash site and body of Yamamoto were found the next day in the jungle north of Buin by a Japanese search and rescue party, led by army engineer, Lieutenant Hamasuna. According to Hamasuna, Yamamoto had been thrown clear of the plane's wreckage, his white-gloved hand grasping the hilt of his katana, still upright in his seat under a tree. Hamasuna said Yamamoto was instantly recognizable, head dipped down as if deep in thought. A post-mortem of the body disclosed that Yamamoto had received two 50-caliber bullet wounds, one to the back of his left shoulder and another to his left lower jaw that exited above his right eye. The Japanese navy doctor examining the body determined that the head wound killed Yamamoto. 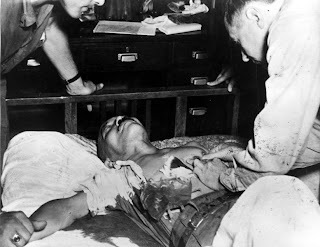 The more violent details of Yamamoto's death were hidden from the Japanese public; the medical report was whitewashed, changed "on orders from above", according to biographer Hiroyuki Agawa. His staff cremated his remains at Buin, and the ashes were returned to Tokyo aboard the battleship Musashi, Yamamoto's last flagship. Yamamoto was given a full state funeral on 5 June 1943, where he received, posthumously, the title of Marshal and was awarded the Order of the Chrysanthemum, (1st Class). He was also awarded Germany's Knight's Cross of the Iron Cross with Oak Leaves and Swords. Part of his ashes were buried in the public Tama Cemetery, Tokyo, and the remainder at his ancestral burial grounds at the temple of Chuko-ji in Nagaoka City. 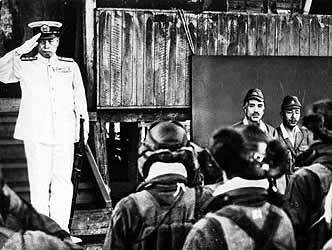 He was succeeded as commander-in-chief of the Combined Fleet by Admiral Mineichi Koga. Perhaps the most persistent problem concerning the Japanese planning for and conduct the attack on Pear Harbour concerns American intelligence or, more accurately, the treatment afforded American intelligence by various investigations, hearings and apparently historical works on the subject. The last that can be said is that in the immediate post-war situation, indeed even before victory over Japan was an accomplished fact, there were a series of moves, primarily by a deliberately and biterly partisan Republian Paty in an attempt to discredit Franklin D. Roosevelt, president, administration and memory, which gave rise to a number of conspiracy theories. These, frankly, have been afforded infinitely more attention than they deserved. Specially these charges have been that Roosevelt personally, and Washington, generally knew that the attack on Pearl Harbour was coming but that the commanding military and naval officers in Hawaii were not properly warned, that the British knew that an attack on Pearl Harbour was planned but made no attempt to warn the Americans because it was in Britain's national interest to ensure American entry into the war, not necessarily that she avoided attack, and the Soviet Union also knew but, like the British and for similar reasons, her representatives managed to avoid mentioning this knowledge in conversation with their American opposite numbers. 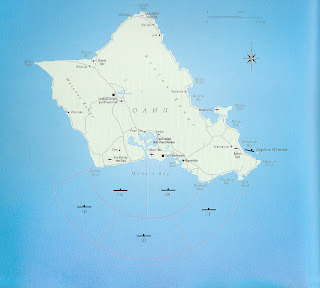 In addition to these three main theses, there were repeated claims by the commanders on Oahu, Admiral Husband E. Kimmel, commander-in-chief US Pacific Fleet, and Lieutenant-General Walter C. Short, overall commander of the Army Air force formations in the Island, that they were deliberately denied vital information which prevented their being alerted against surprise attack, this information supposedly being available in Washington. Kimmel and Short protested their innocence until their deaths, since which time various individual shave continued that both men be reinstated with full rank in order to provide some form of posthumous vindication. Kimmel was relieved of his command ten days after the attack. At the moment he was planning and executing retaliatory moves, including an effort to relieve and reinforce Wake Island that could have led to an early clash between American and Japanese carrier forces. The Roberts Commission appointed by President Franklin D. Roosevelt to investigate the attack determined that Kimmel and his counterpart Army Lieutenant General Walter Short were guilty of errors of judgement and dereliction of duty in the events leading up to the attack. Kimmel, in testifying for numerous hearings, defended his decisions by saying important information had never been made available to him. Kimmel retired early in 1942. His son, Manning, died when the submarine he commanded (USS Robalo) was sunk near Palawan in July 1944. Kimmel himself worked for Frederic R. Harris, Inc. after the war. Kimmel died at Groton, Connecticut, on May 14, 1968. In 1994 Kimmel's family, including his grandson, South Carolina broadcaster Manning Kimmel IV, attempted for the third time to have Kimmel's four star rank re-instated. President Bill Clinton turned down the request, as had Presidents Richard Nixon and Ronald Reagan before him. A 1995 Pentagon study concluded other high-ranking officers were also responsible for the failure at Pearl Harbor but did not exonerate Kimmel. On May 25, 1999, the United States Senate, by a vote of 52–47, passed a non-binding resolution to exonerate Kimmel and Short and requested that the President of the United States posthumously restore both men to full rank. Senator Strom Thurmond (R-SC), one of the sponsors of the resolution, called Kimmel and Short "the two final victims of Pearl Harbor." Neither President Clinton nor President Bush after him did so. The Senate enquiry in 2000 issued a lengthy exoneration of Kimmel's conduct. His relationship with the Navy and Admiral Husband E. Kimmel's headquarters, CinCPAC, was cordial but not close. He felt secure from attack because of the Navy's presence while Kimmel was content that the Army would prevent air attack or invasion of the Hawaiian Islands. Short's chief concern was security against sabotage by the ethnic Japanese in Hawaii, the nisei. When he received a war warning from Chief of Staff General George C. Marshall on 27 November, he interpreted it in a limited fashion and set guards to watch over aircraft. This involved parking the planes in tight blocks, and thus making them excellent targets from the air. After the attack on Pearl Harbour he was relieved of his command and reverted to the rank of major-general. He retired from the army in February 1942 and went to work for Ford in Dallas. An investigation into Pearl Harbour found him, with Kimmel, guilty of errors of judgement, but he never got the court martial he felt would vindicate him. He died on 3 September 1949. 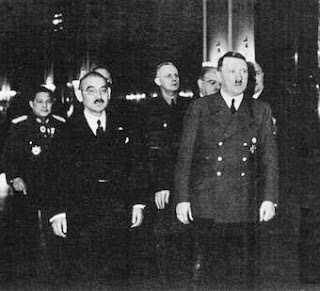 Adolf Hitler's reckless promise to Japan had been made during a series of talks in Berlin with Yosuke Matsuoka, the pro-Axis Japanese Foreign Minister, in the spring of 1941 just before the German attack on Russia. The captured German minutes of the meeting enable us to trace the development of another one of Hitter's monumental miscalculations. They and other Nazi documents of the period show the Führer too ignorant, Göring too arrogant and Ribbentrop too stupid to comprehend the potential military strength of the United States, a blunder which had been made in Germany during the First World War by Wilhelm II, Hindenburg and Ludendorf. There was a basic contradiction from the beginning in Hitler's policy toward America. Though he had only contempt for her military prowess he endeavoured during the first two years of the conflict to keep her out of the war. This, we have seen, was the main task of he German Embassy in Washington, which went to great lengths, including the bribing of Congressmen, attempting to subsidize writers and aiding the American First Committee, to support the American isolationists and thus help to keep America from joining Germany's enemies in the war. That the United States, as long as it was led by President Roosevelt, stood in the way of Hitler's grandiose plans for world conquest and the dividing up of the planet among the Tripartite powers the Nazi dictator fully understood, as his various private utterances make clear. The American Republic, he saw, would have to be dealt with eventually and, as he said "severely". But one Nation at a time. That had been the secret of his successful strategy so far. 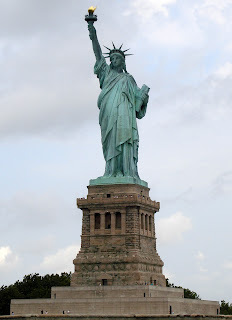 The turn of America would come, but only after Great Britain and he Soviet Union had been struck down. Then, with the aid of Japan and Italy, he would deal with the upstart Americans, who, isolated and alone, would easily succumb to the power of the victories Axis. japan was the key to Hitler's efforts to keep America out of the war until Germany was ready to take her on. Japan, as Ribbentrop pointed out to Mussolini on March 11, 1940, possessed the counterweight to the United States which would prevent the Americans from trying to intervene in Europe against Germany as they had in the first world war. 'Matsuoka visits Hitler (March 1941, Matsuoka subsequently drifted into obscurity and lived in retirement through the war years. Following the surrender of Japan, he was arrested by the Supreme Commander of the Allied Powers in 1945 and held at Sugamo Prison. However, he died in prison in 1946 before his trial on war crimes charges came up before the International Military Tribunal for the Far East. In their wartime dealings with the Japanese, Hitler and Ribbentrop at first stressed the importance of not provoking the United States to abandon her neutrality. By the beginning of 1941 they were exceedingly anxious to draw Japan into the war, not against America, not even against Russia which they were shortly to attack, but against Britain which had refused to give in even when apparently beaten. Early in 1941 German pressure on Japan stepped up. On February 23, Ribbentrop received at his stolen estate at Fuschl, near Salzburg, the fiery and hot-tempered Japanese ambassador General Hiroshi Oshima, who had often impressed others as more Nazi than the Nazis, Though the war, Ribbentrop told his guest, was already won, Japan should come in "as soon as possible, in its own interest," and seize Britain's empire in Asia. A surprise intervention by Japan, he continued, was bound to keep America out of the war. America, which at present is not armed and would hesitate to expose her Navy to any risks west of Hawaii, could do this even less in such a case. If Japan would otherwise respect the American interests, there would not even be the possibility for Roosevelt to use the argument of lost prestige to make war plausible to the Americans. It was unlikely that America would declare war if it had to stand by while Japan took the Philippines. But even if the United States did get involved, Ribbentrop declared "this would not endanger the final victory of the countries of the Three-Power Pact." The Japanese fleet would easily defeat the American fleet and the war would be brought rapidly to an end with the fall of both Britain and America. This was heady stuff for the fire-eating Japanese envoy and Ribbentrop poured it on. He advised the Japanese to be firm and use "plain language" in their negotiations in Washington. The Nazi Foreign Minister had one warning to give, the one that had failed so dismally with Franco: If Germany should ever weaken, Japan would find itself confronted by a world coalition within a short time. We were all in the same boat. The fate of both countries was being determined now for centuries to come... A defeat of Germany would also mean the end of the Japanese imperialist idea. To acquaint his military commanders and the top men in the Foreign Office with his new Japanese policy, Hitler issued on March 5, 1941, a top-secret directive entitled "Basic Order No. 24 Regarding Collaboration with Japan." 'It must be the aim of the collaboration based on the Three-Power Pact to induce Japan as soon as possible to take active measures in the Far East. Strong British forces will thereby be tied down, and the centre of gravity of the interest of the United States will be diverted to the Pacific. The conman aim of the conduct of war is to be stressed as forcing England to her knees quickly and thereby keeping the United States out of the war. The seizure of Singapore as the key British position in the Far East would mean a decisive success for the entire conduct of war of the Three-Powers. Hitler also urged the Japanese seizure of other British naval bases and even American basis, "if the entry of the United States into the war cannot be prevented." He concluded by ordering that "he Japanese must not be given an intimation of the Barbarossa operation." The Japanese Ally, like the Italian, was to be used to further German ambition, but neither government would be taken into the Führer's confidence regarding his intention to attack Russia. A fortnight later, on March 18, at a conference with Hitler, Keitel and Jodl, Admiral Raeder strongly urged that Japan be pressed to attack Singapore. The opportunity would never again be so favourable, Raeder explained, what with "the whole English fleet contained, the preparedness of the U.S.A. for war against Japan and the inferiority the U.S. fleet compared to the Japanese." 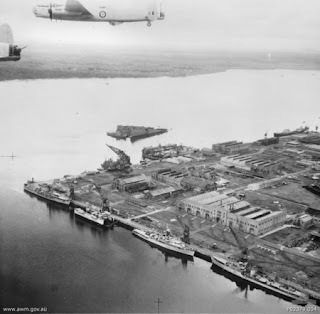 The capture of Singapore, the Admiral said, would "solve all the other Asiatic questions regarding the U.S.A. and England' and would of course enable Japan to avoid war with America, if she wished. There was only one hitch, the Admiral opined, and mention of it must have Hitler frown. According to naval intelligence, Raeder warned, Japan would move against the British in South-east Asia only "if Germany proceeds to land in England." There is no record in the Navy minutes of this meeting indicating what reply Hitler made to this remark. Raeder said something else that the Führer did not respond to. He "recommended" that Matsuoka "be advised regarding the designs on Russia." Though Hitler had laid down that Matsuoka not be told about he impending German attack on Russia, a necessary precaution to keep the news from leaking out, but nevertheless, as we shall see, one that would have disastrous consequences for Germany, Ribbentrop did drop several broad hints. Relations with the Soviet Union, he told his visitor, were correct but not very friendly. Moreover, should Russia threaten Germany, "the Führer would crush Russia." 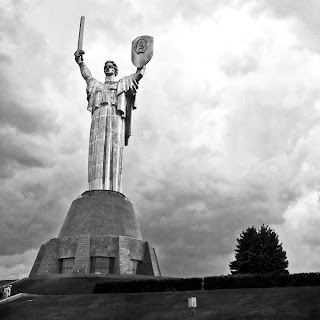 The Führer was convinced, he added, that if it came to war "there would be in few months no more Russia." Matsuoka, says Schmidt, blinked at this and looked alarmed, whereupon Ribbentrop hastened to assure him that he did not believe that "Stalin would pursue an unwise policy. "[Japan and Russia had signed a Neutrality Pact,sic] At this juncture, says Schmidt, Ribbentrop was called away by Hitler to discuss the Yugoslav crisis and failed even to return for the official lunch which he was supposed to tender the distinguished visitor. Hitler paid dearly not only for this assurance, so causally given, but for his deceit in not telling the Japanese about his intention to attack Russia as soon as the Balkans were occupied. Somewhat coyly Matsuoka had asked Ribbentrop during a talk on March 28 whether on his return trip he "should remain in Moscow in order to negotiate with the Russians on the Non-aggression Pact or the Treaty of Neutrality." [In fact he did not inform Ribbentrop either that he would sign the Neutrality Pact in Moscow, sic]. The dull-witted Nazi Foreign Minister replied smugly that Matsuoka "if possible should not bring up the question in Moscow since it probably would not altogether fit into he framework of the present situation." He did not quite grasp the significance of what was up. But by the next day it had penetrated his wooden mind and he began the conversation that day by referring to it. First of all he threw in, as casually as Hitler would do on April 4, a German guarantee that if Russia attacked Japan "Germany would strike immediately." He wanted to give this assurance, he said, " so that Japan could push southward toward Singapore without fear of any complications with Russia." When Matsuoka finally admitted that while in Moscow on his way to Berlin he himself had proposed a non-aggression pact with the Soviet Union and hinted that the Russians were favourably inclined toward it, Ribbentrop's mind again became somewhat of a blank. He merely advised that Matsuoka to handle the problem in a "superficial way." 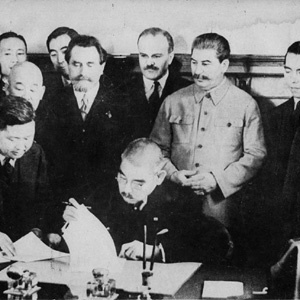 But as soon as the Nipponese Foreign Minister was back in Moscow on his trip home, he signed a treaty of neutrality with Stalin which, as Ambassador von der Schulenburg, who foresaw the consequences, wired Berlin, provided for each country to remain neutral in case the other got involved in the war. This was one treaty, it was signed on April 13, which Japan honoured to the very last despite subsequent German exhortations that she disregard it. For before the summer 1941 was out the Nazis would be begging the Japanese to attack not Singapore or Manila but Vladivostok! At first however, Hitler did not grasp the significance of the Russo- Japanese Neutrality Pact. In April 20 he told Admiral Raeder, who inquired about it, that it had been "made with Germany's acquiescence" and that he welcomed it "because Japan is now restrained from taking action against Vladivostok and should be induced to attack Singapore instead. At this stage Hitler was confident Germany could destroy Russia during the summer. He did not want Japan to share in this mighty feat any more than he had desired that Italy should share in the conquest of France. And he was absolutely confident that Japanese help would not be needed. Ribbentrop, echoing his master's thoughts, had told Matsuoka on March 29 that if Russia forced Germany "to strike" he would "consider it proper if the Japanese Army were prevented from attacking Russia." But the views of Hitler and Ribbentrop on this matter changed very suddenly and quite drastically scarcely three months later. Six days after the German armies were flung into Russia, on June 28, 1941, Ribbentrop was cabling the German ambassador in Tokyo, General Eugen Ott, to do everything he could get the Japanese to promptly attack Soviet Russia and also to argue that this was the best way of keeping America neutral. It maybe expected (Ribbentrop explained) that the rapid defeat of Soviet Russia, especially should Japan take action in the East, will prove the best argument to convince the United States of the utter futility of entering the war on the side of a Great Britain entirely isolated and confronted by the most powerful alliance in he world. Matusoka was in favour of immediately turning on Russia, but his views were not accepted by the government in Tokyo, whose attitude seemed to be that if the Germans were rapidly defeating the Russians, as they claimed, they needed no help from the Japanese. However, Tokyo, was not so sure about a lightning German victory and this was the real reason for its stand.But Ribbent5rop persisted. On July 10, when the German offensive in Russia was really beginning, to roll and even Halder, as we have seen, thought that victory already had been won, the Nazi Foreign Minister got off from his special train on the Eastern front, a new and stronger cable was sent to his ambassador in Tokyo. [Ribbentrop kept trying all that fall and several times during the next two years to induce the Japanese to fall upon Russia from the rear, but each time the Tokyo government replied politely, "so sorry, please. "sic] 'Since Russia, as reported by he Japanese ambassador in Moscow, is in effect close to collapse... its simply impossible that Japan does not solve the matter of Vladivostok and the Siberian area, as soon as her military preparation are completed...I ask you to employ all available means in further insisting upon Japan's entry into the war against Russia the soonest possible date... The sooner this entry is effected, the better it is. The natural objective still remains that we and Japan join hands on the T rans-Siberian railroad before winter starts. Such giddy prospects did not turn the head of even the militaristic Japanese government. Four days later ambassador Ott replied that he was doing his best to persuade the Japanese to attack Russia as soon as possible, that Matsuoka was all for it, but he, Ott, had to fight against "great obstacles" in the Tokyo cabinet. As a matter of fact the fire-eating Matsuoka was soon forced out of the cabinet. With his departure, Germany lost, for the time being, its best friend, and though closer relations were later restored between Berlin and Tokyo they never became close enough to convince the Japanese of the wisdom of helping Germany in the war against Russia. Once more Hitler had been bested at his own game by a wily ally. Japanese Admiral Soemu Toyoda' Promoted to full admiral on 18 September 1941, at the time of the attack on Pearl Harbour, Toyoda was Commander-in-Chief of the Kure Naval District. Toyoda was strongly opposed to the war with the United States, which he viewed from the start as "unwinnable. "On 10 November 1942, Toyoda became a member of the Supreme War Council. After the war, Toyoda was interrogated by Rear Admiral Ralph A. Ofstie in Tokyo on 14 November. He was viewed as "highly intelligent and widely informed", and was observed to be a strong critic of the amount of political power the Army held in the Japanese government. He also expressed his opinion that the war with China should have been ended "even at some sacrifice" so that the men and resources could be redeployed to the Pacific theater. Toyoda was subsequently arrested by SCAP authorities, held in Sugamo Prison, but was not charged with any war crimes and later released.He died in 1957 of a heart attack at the age of 72.